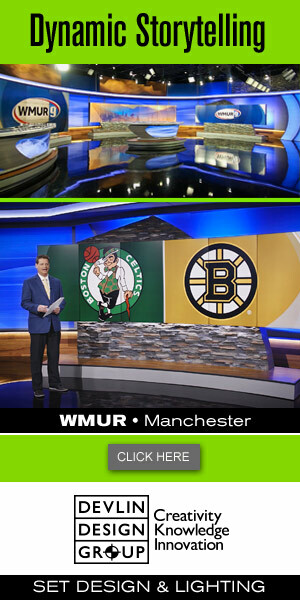 WPRI, the CBS affiliate in Providence, Rhode Island, celebrated its 64th birthday March 27, 2019. Ted Nesi, a politics and economy reporter at the station, tweeted a vintage photo of the station’s set for its 1962 election — when the station was known as WPRO. Happy Birthday, @wpri12! 🎉 📺 Our station turns 64 today: we went on the air this day in 1955 as a division of Cherry & Webb department store. The set features a ring-shaped anchor desk and temporary walls with candidate photos and manual embedded counters beneath. A local attorney, Brian Gallogly, notes that the set was built at the city’s Sheraton hotel, which explains the stone railing and chandelier visible in the photo. In the early decades of TV broadcasting it wasn’t uncommon for stations to use local hotels, ballrooms or theaters as studios — either permanent or temporary. These types of buildings often had larger, open spaces that could be rented or converted into broadcasting spaces relatively easily. In fact, when “Today” debuted in 1952, it used space that doubled as as the RCA Exhibition Hall in New York City and would eventually, in 1962, start sharing space with a Florida-themed store and exhibit space in Rockefeller Center. WLS in Chicago still occupies a building that, in previous lives, was a vaudeville theatre, cinema and retail space before becoming home to the experimental TV station that would eventually become the ABC O&O. WPRO was an ABC affiliate from 1977 to 1995 and served as a secondary affiliate for the network from 1956 to 1963, the latter of which would have been during the time the photo was taken.